An exciting day for Jet travel . . . January 25, 1959 Today is the 52nd anniversary of American Airlines' Inaugural Jet Flight which was from Los Angeles to New York City and return. Today, as I reminisce about the excitement of that historic day, I feel the same emotions fill my soul with the pleasure of having the opportunity of flying with American Airlines. 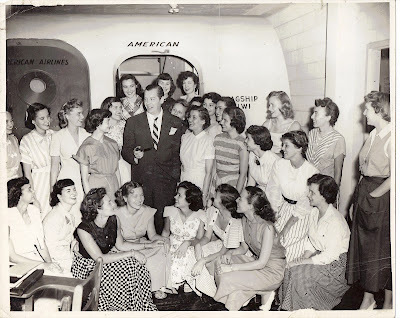 The blog I started two years ago, "American Airlines 707 Jet Stewardess" has had over 4000 hits in the last eight months, when I started keeping track of such things. At some point along the way, I was encouraged by others to convert my blog into a book. This I have now done. It is entitled More Than A Ticket and was printed by a University Press. At the request of the American Airlines KIWI Club, I sent a copy for their archives. A second copy was donated to the KIWI Club auction which was held at their convention in 2010. I'm sure it sold for several zillion $ but don't know the exact figure. Here's a picture of the book. Now that my blog has morphed into a book, I'm in the process of editing the book back into my blog, so I'll add a bit at a time. It will incorporate most of what has appeared on my blog from its inception until today's date, but in a much more attractive format as well as with more detail and many more photos. 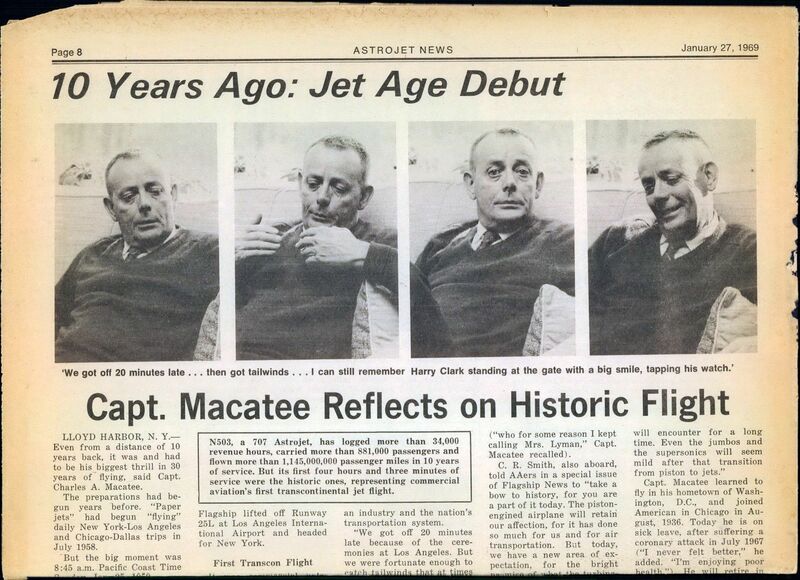 I'm adding the first segment of the book today, in celebration of the 52nd anniversary of that first commercial jet flight in American Airlines' Boeing 707 with Captain Macatee. For more details about purchasing "MORE THAN A TICKET" contact Argie Hoskins. I will sell through PayPal. Leaving home, Argie and C. L. picked up their suitcases and went their separate ways. "Sister" went one way and "Brother" another into an unknown world. 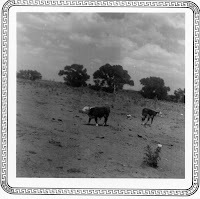 Our journey took us away from rattlesnakes, horned toads, the warmth of a gas heater and Mama's home cooking with its steaks from range fed cattle, cakes from scratch and homemade ice cream. My restless spirit said, "Go!" from our home in Animas Valley, New Mexico. It was hard to leave a small five room (two adobe) home without electricity, and raw milk to drink, I wanted to go! And step by step I made my way to the big city: "Chicago, Chicago,” many people's hometown. Tears and smiles. 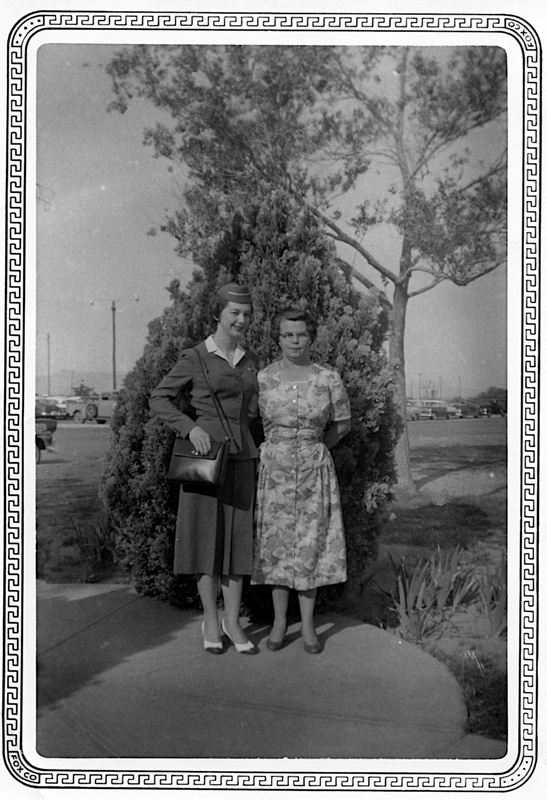 First step was to El Paso to live with my mother's sister Aunt Boo, who was like a sister to me. Uncle Bill and Aunt Boo, along with cousins Effie and Freddie, supported me while I was working for El Paso Natural Gas Company. 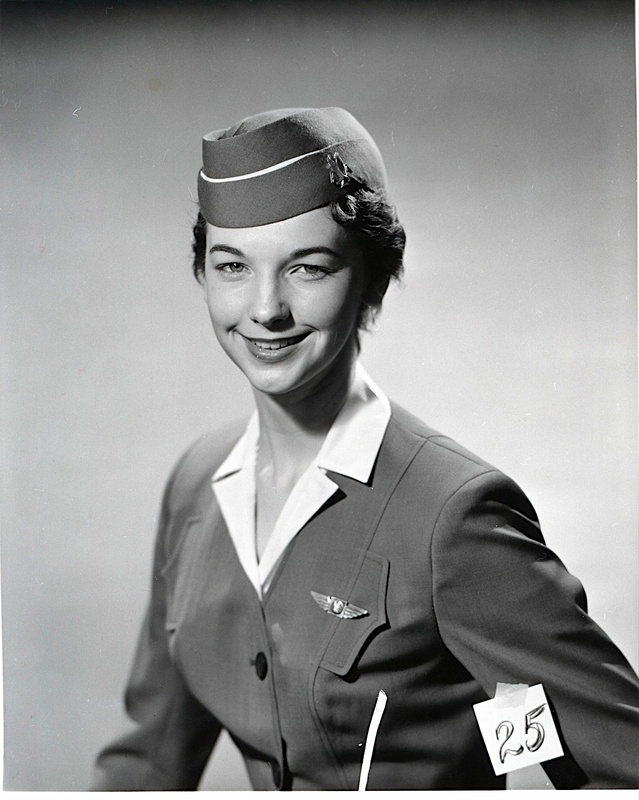 One day, a friend with whom I was working suggested that I would be a likely candidate for becoming a stewardess. 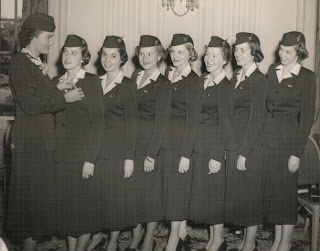 To become a stewardess? Now, that was a novel idea. I was afraid of flying and what's more, afraid of heights. As a child, after running or other rigorous activities, I would faint on the playground. Having had a dizziness challenge, the dream of flying was "pie in the sky," as my mother would say. My dad said that my “itchy” feet had sprouted wings. The closest that I had ever gotten to a plane was while visiting my grandparents in El Paso. As a small child, while playing on the patches of lawn with my dolls, I would hear and watch the Ft. Bliss Warbirds fly over the yard. The sound droned across the sky. Those planes seemed so remote to me. 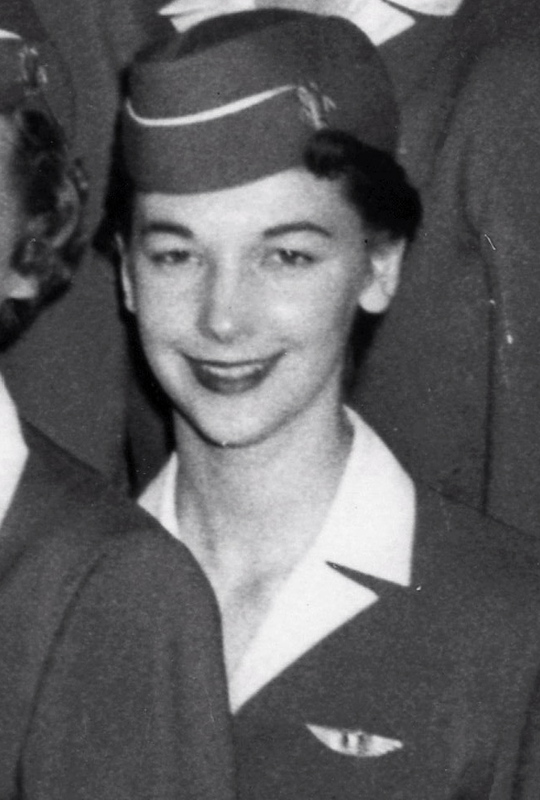 For a young lady being a stewardess was a sought after job. The job market was very competitive. Filmmakers and novelists had encouraged the wanderlust and want for glamour in the American Girl. I had heard of her poise and charm. Here was a chance to see the world, while meeting all kinds of interesting people, including passengers who could afford to be pampered. In turn, the stewardess would be rewarded with the attention of a celebrity. All this was depicted in an American Airlines' advertisement. 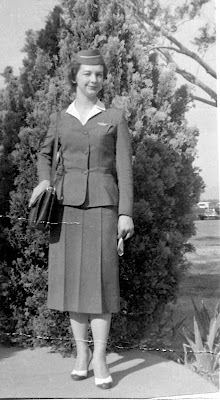 Being a stewardess and serving in a fashionable manner was a desirable goal for a young lady of my time. I had been trained by my mother and grandmother to be a lady. In the sky would be a good place to be one. It appealed to my femininity. Sounded good to me. Ft. Worth, Texas, waiting for my flight and thinking, "Well, at least, when I looked in the mirror, I did look sorta cute in the cap the interviewer had me try on, and I really do like to visit with people.” Thinking that I had failed the interview, I felt a wave of sadness wash over me. I prayed to the Heavens above that whatever happened would be for the best. My hands still tremble with excitement! Some would say it is old age, but I know the tears of joy are not old age, as I ponder this telegram. That moment changed my life. My family was so excited when they picked me up at the El Paso Airport! This would be the airport into which I would most frequently fly, either as a destination or a stop along the way. On that evening, little did I know that I was about to embark on a journey that would challenge me intellectually and emotionally while learning a lot about myself. Dare I? I didn't know that in the future, I would be thrilled by glorious southwest sunsets and powerful thunderstorms that would rock the plane this way and that as the route took us through huge puffy clouds with sudden drops in altitude. The southern part of New Mexico is where I found the power of nature is amazingly stated. New Mexico, The Land of Enchantment, was graced with beauty both on the land and in the sky. My home! 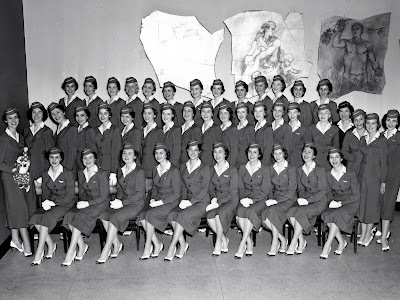 These pretty faces were faces of tired, enthusiastic and very smart young ladies who were pushed and pushed again to learn all that was required to be the "best of the best" as American Airline stewardesses. What a privilege! 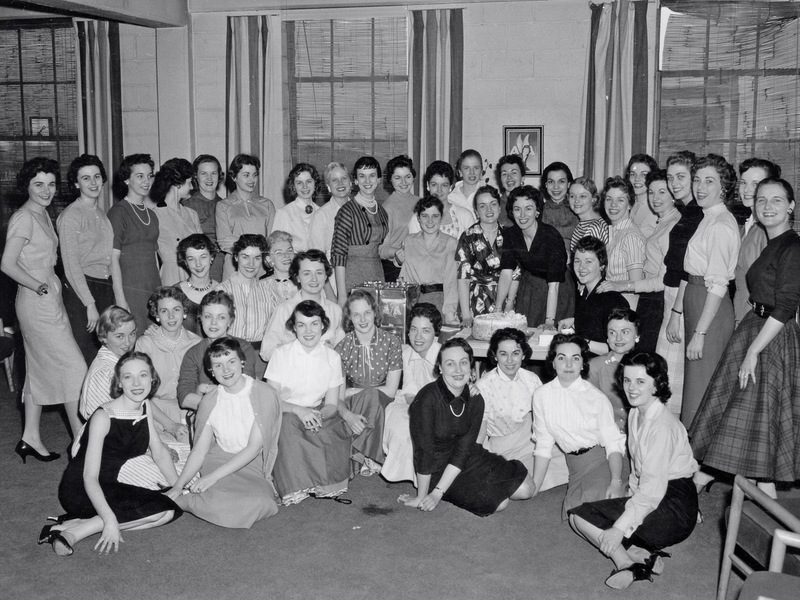 American Airlines' Chicago hangar at Midway Airport housed the Stewardess College when I attended the school in April and May of 1957. 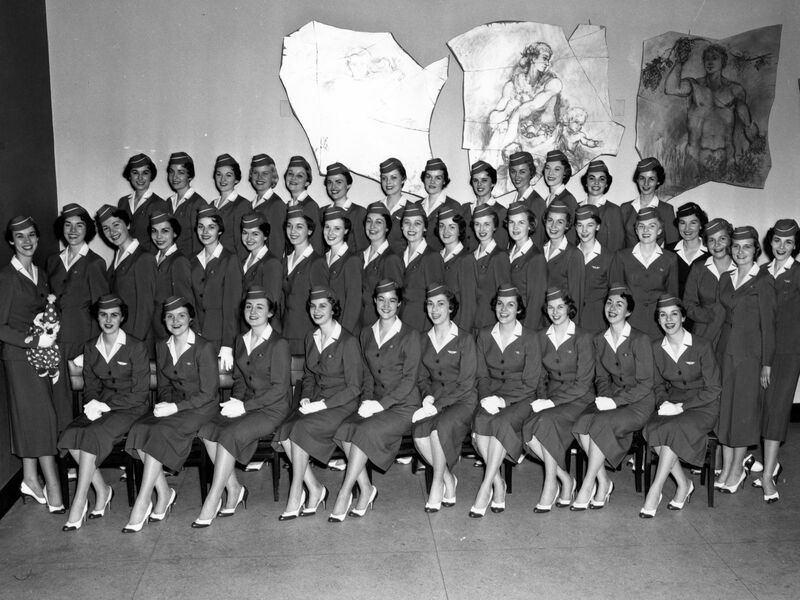 Later that same year, the world's first facility for flight attendant training, the American Airlines Stewardess College, was built in Dallas/Fort Worth. Before this outstanding event, the College was in a hangar at Midway field. Chicago Midway International is located on the city's southwest side, eight miles from Chicago's Loop. It is in the area of 55th Street and Cicero Avenue. This was the setting for Alfred Hitchcock's movie, "North by Northwest" starring Cary Grant. Incidentally, both of these gentlemen flew on flights with me. Yes, this is where I went to school. Becoming a stewardess with American Airlines meant that I had to, and I mean had to, study, memorize and role play what I learned and be tested on the same. This was done in fighter pilot mode with full throttle ahead. Oh, yes, the fear of washing out and going back home with egg on my face and an ocean of tears in my heart was the pressure I felt. Along with the fear of failure and the excitement of becoming what I desired and expected was my challenge in that hangar at the Midway Airport in Chicago. Day after day, night after night, I groomed myself for that eventful day of graduation. One of the students, in that hangar was Polly. We have become friends forever and ever. We understood what it was like on both sunny and rainy days in that hangar. The rigors and determination paid off as we journeyed to build character to sustain us through the “growing experiences” of life. The lessons of commitment, loyalty, and completing the task at hand were learned when the eggs needed to be gathered and the chickens needed to be fed. Even when you are discouraged, “Get out of bed and amount to something!” We did it! Hallelujah! Thanks for the memories. It is great to revisit moments in the hangar with exhaust smells from the runway as planes took off, not to forget the smell of the rain on the tarmac. While coming and going from the hangar with rain pouring on my head I learned what the word inclement weather meant. I ponder and am grateful for hard times, good times and times forgotten. I cannot remember everything. What I remember is worth remembering. 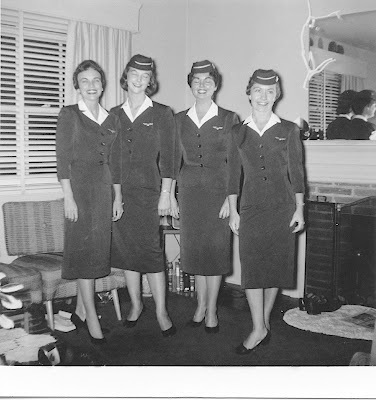 Becoming a stewardess was not an easy experience for me. Having finished two years of college, I never had experienced the rigors of education such as I encountered in that hangar. Learn it fast, now, and don't forget! Learning all the Stewardess Manual stuff was hard – such as Administrative Procedures, Basic Procedures, Restrictions and Irregularities, Convair Procedures, DC-6 Procedures, DC-7 Procedures and later Boeing 707 Jet Procedures. Along with all this, there was a section on Special Procedures, Emergency Procedures, Oxygen, Illness and Injuries, Forms and Reports, and of course, the Reference Material. Each of these topics, with the emotional trauma of learning it well, fast, and applying the concepts in a professional manner, could fill a book. Honestly, I had the foundation for learning and applying the skills needed for Emergency Training. I am amazed at my metamorphic change from caterpillar to butterfly. What does this have to do with me and Emergency Training? The caterpillar evolves step by step. As I ponder my training as a stewardess and the "me" who emerged from the training, it was all good. For the successful handling of any emergency, it was important to know the task and how to do it on an automatic level and depend on my knowledge and skill with no guess work. Wow! I needed to learn sooo much. As Daddy “Al” Hoskins said, “ This is the task that needs to be done, this is what I am going to do, this is what you are going to do. Now be careful.” And good old American Airlines picked me, Argie Hoskins, because they knew I could do it! Now to get rid of the self doubts and have confidence inside of me. Along the way something really great happened, I found in me, a new me. Not only did I know the procedures, but knew there was no substitute for good judgment. You can't learn everything from a book. Always have in mind plan "A" and plan "B" for survival. Later, as a school teacher, we had workshops on "thinking outside the box." I realized that I had been thinking outside the box for years and years. My first Emergency Training was focused on DC-6, DC-6B, DC-6 Coach, DC-7, DC-7 Coach, DC-7 Dual Service, and the Convair. The Emergency Equipment: EXITS and how to open the window exits from inside, and in some cases, the outside of the aircraft. ROPES were located in exit windows and doors of certain aircraft. EVACUATION SLIDES were stored on the cabin doors. The lounge exit had a slide. It was fun to practice our skills while overcoming fear. FIRE EXTINGUISHERS were located in various locations on the several aircraft. OXYGEN cylinder, outlets and walk-around bottles were strategically placed. FLASHLIGHTS were on some aircraft. EMERGENCY LIGHTS replaced flashlights on all aircraft. We always checked the SERVICE KIT which contained First Aid Equipment. We were trained to remember to take the SERVICE KIT with us if we evacuated. We didn't have the theme band-aids that children plaster all over themselves these days. That would have been an interesting demand. A FIRE AXE was located on the forward side of the cockpit door on all aircraft. FIRE DETECTORS, EXTINGUISHING EQUIPMENT and FLOTATION SEAT CUSHIONS were on some aircraft. There is no substitute for good judgment. If an emergency occurs, Stewardesses are assigned specific responsibilities. 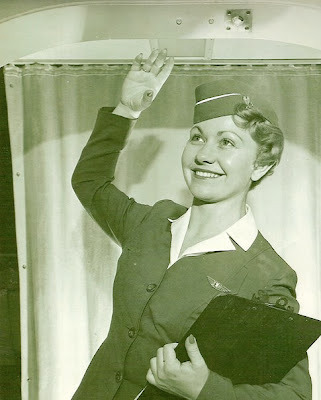 If the specific location of the First Stewardess makes it difficult or time consuming to accomplish her duties as outlined, then good judgment should dictate that she carry out the Second Stewardess' duties and vice - versa. The Second Stewardess under such conditions should take her cue from the First Stewardess. Now the task for me was to know what responsibilities were assigned to the First Stewardess and Second Stewardess. I felt that I could do both at the same time. That has been my challenge; I think that I can do it all, but I can't! I must be in charge of my stewardship and others must be committed to their stewardship. In case of an emergency, I must know what I can do and do it! Don't expect someone else to solve the problems that I must handle. The kind of emergency situations that I was trained for back in the 1950's were varied. A“Belly Landing” was when the gear would not come down. This was not very different from a normal landing, however, there was the possibility of the shock from the hard landing being different, depending on whether the nose or the tail hit first. The Captain would announce which landing configuration to expect. Our job was to be prepared for any eventuality. I remember the advice from stewardess school was to inform the passengers to relieve their bladders so that on impact the bladder would not burst. I never found that in the manual, but thought it was a good idea. Along with that idea was the use of the pillows and the position of the body on impact. Nose wheel up, main gear down, will finally position the aircraft with its nose down and tail up! This position business of landing was hard for me because of the sequencing challenge in my brain. Up, down, down, up! Concepts had to be over learned! From data presented in school, I felt comforted that American Airline was the best for their concern and training for emergency procedures. I would do it all over again for American. Step by step, day by day, I knew that I was driven to graduate from the school on the south side of Chicago. While in training, I was told by an instructress that I was shy and didn't talk much. She concluded by reassuring me that I was going to make it. I was always afraid that I was going to washout, which meant to get my walking papers. Oh, help! One Sunday, riding back to the hangar from church, looking out the window of the subway, the "L", and then the bus, I missed my exit. The bus driver announced, "End of line." It was dark and I had no idea where I was. The driver was helpful enough to direct me to a bar around the corner for a phone. The bar man said, "Use the phone outside." I had no idea who to call, where to go, or what to do and, can you believe, very little money. All I knew was that I was on the south side of Chicago and my parents would be worried if they knew anything about me being on the south side of Chicago, at night! On a very low level of awareness I knew of gangs. To make things worse, the day was a cold April day, and night was even more biting, to which one of my new friends at the hangar had responded by insisting that I borrow her fur or fur-looking full length coat. Here I stood in the cold night in front of a bar not knowing what to do. No transportation to the airport hangar, no money for a taxi, and young and pretty in a fur coat. You guessed it! I prayed in my Catholic friend's fur coat. A car stopped with several people in it. I couldn't tell but it looked somewhat like a family. Thanks to above, they took me to the airport and dropped me off without engaging in much conversation. Wherever you are, THANK YOU! Later, I became familiar with the transportation system of Chicago. My first apartment was on Wrightwood Avenue, north of the Loop. From Wrightwood Avenue, I took a trolley car to the Midway Airport to catch my plane. Boarding the trolley in front of a Chinese laundry, where interesting foreign looking people gathered to have conversation, my curiosity of a new world was spiked with questions. Reaching across cultures, my eyes and my heart opened. Take a look at the phone number. Yes, life was more simple. 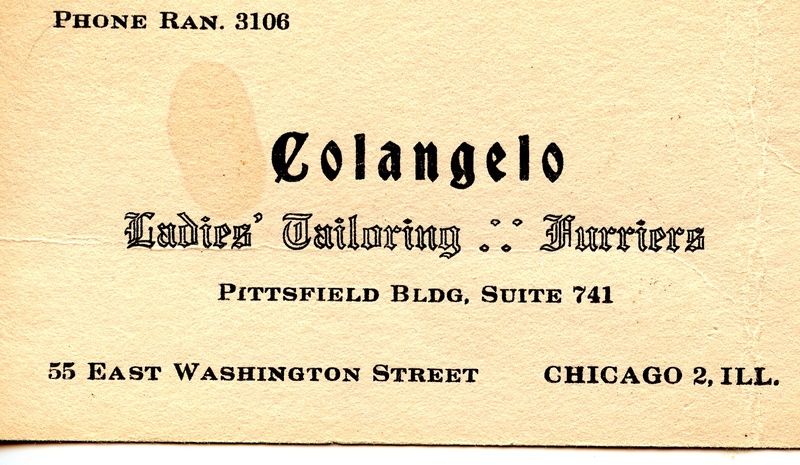 Mr. Colangelo was a kind man and very talented as a tailor. I say talented, because he designed my American Airline uniform to make me, Argie Hoskins, really look like a stewardess. In computer terms, he knew where to cut and paste. Thank you, Mr. Colangelo. Another "funny" like learning to mix drinks, I had never tasted the fruit of the art of mixing. Wow! I seemed to catch on faster than most. Figure that! Martinis and Manhattans. Can't remember which has an olive? And which the cherry? I think the Martinis have the olive and Manhattans, the cherry. Oh, well, I never indulged anyway because it didn't make sense to me. Another experience that comes to my mind was the need to know how to find the rope in the exit windows then pull it on to the wing and down to the ground with me hanging on to the rope. I did it! This is when I learned the difference between “knowing and doing.” Another “doing” was the courage I had to find to control my heart and my mind and JUMP! Yes, out the door and down the evacuation slide! I did it! I still get dizzy when I ride an escalator going down. The escalator moves, the slide didn't! I remember that thrill as if it were this very day. Sometimes I dream of the excitement. How could I, with all my learning challenges, be successful at these things that were difficult for some? These gals were courageous. They set aside their fears and forged on through their tears. 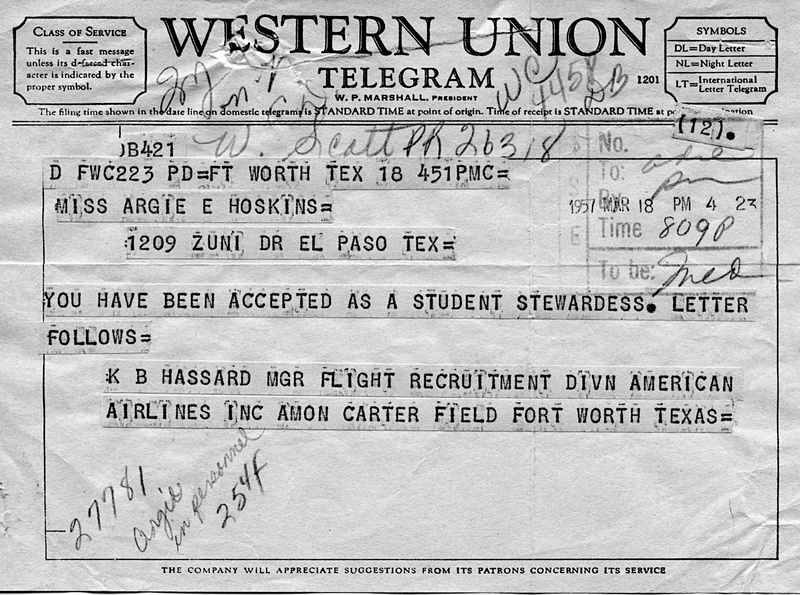 When graduation time came and the company's needs were analyzed as to where stewardesses were needed, assignments were announced. When our base assignments were announced, some were disappointed and there were great big tears because the placement assignment did not meet the expectation while others were elated! Some didn't really care. I remember one, crying, yelling and trying everything she knew to persuade the system to change its mind and re-assign. It didn't work. That was part of the deal, go where you were needed. Didn't we know that when we signed on the dotted line? Well, at last I am in Chicago to stay. This is what I wanted, however, Los Angeles would have been better because one of my old sweethearts was living there. I really wanted to see him. You know what the heart does to the emotions. Gets you all crazy. I was immersed in the view of the world that I was experiencing, so Chicago was just fine. Trained at the historical Midway Airport, "Crossroads of the World," the world's busiest airport where we had been very busy, also. 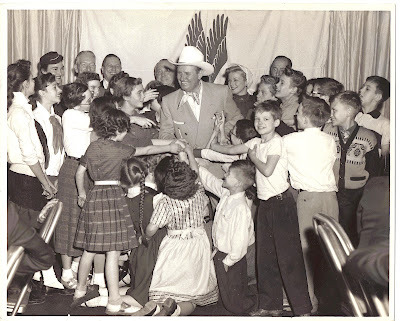 Graduation was held at 4th and Halstead at the historical Stock Yard Inn, Four Seasons room at 1:00 p.m. Tuesday May 21st, 1957. That was an event! Aren't we lovely ladies? 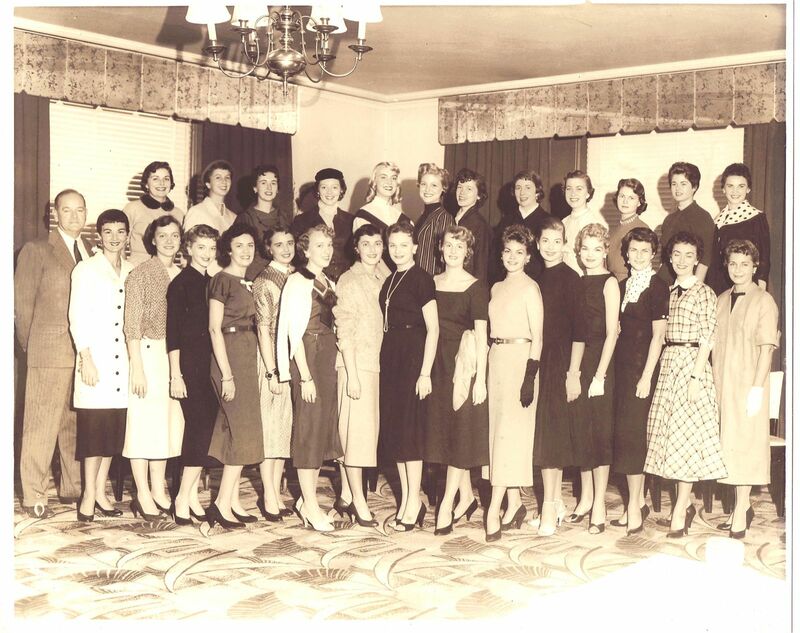 Here we are with our styled hair, dressed in our new brown uniforms and spectator pumps. The spectator is coming back into style. I am glad because I like the two-tone look. 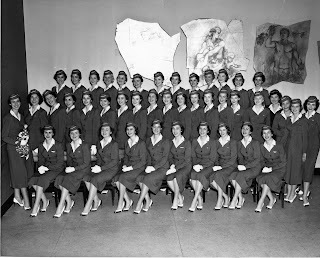 Mildred Jackson interviewed 28,000 young ladies in 1956 and hired 691 of them for American Airlines Stewardess School. "successfully completed" and signed by Mildred Jackson (Millie) along with C. R. Smith and the tremendous instructors. Hallelujah and Hallelujah, again! In school we learned to take care of people, including the irate passenger, which make stewardesses practically perfect wives, Miss Jackson revealed. She said a survey had shown that stewardesses have the lowest divorce rate among former working girls. The day she told us this, it was reassuring but it didn't work for me. I remembered the words of Millie when I signed my divorce papers. Why me! 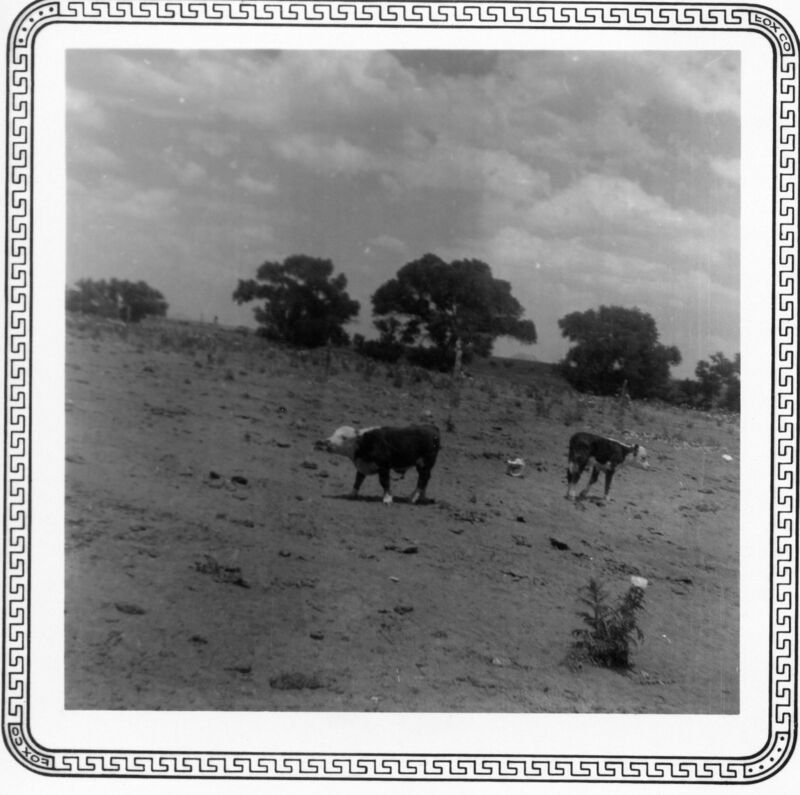 These photos are contributed by Martha Mason, niece of Mildred Jackson. Martha, thank you for your generous contribution. While Mildred Jackson was not interviewing young ladies, she was involved with public relations. As I left stewardess training, this is how I looked with short hair. One day a hair stylist came to the school to "fix us up" with a new “hairdo.” WOW! I could not believe what happened to my long, beautiful hair. It was very hard to keep the tears from bursting forth. I had thick, lovely locks and then "no hair." After the “hairdo," the photographer took our pictures to send home to the local newspapers announcing our training success. This smile was the best that I could muster up. Look at the back of the hair. 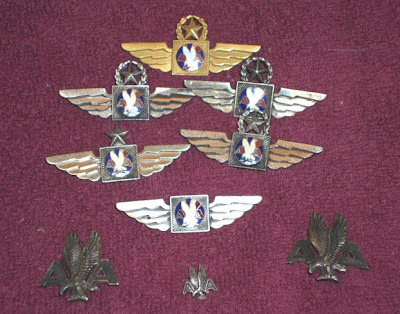 On the 21st of May 1957, I earned my wings. I was more excited over this pinning than when, a couple of years later, I was pinned by an Annapolis graduate Bob Merritt, who had become a navy pilot. I met passenger Bob on a flight from Los Angeles to San Diego. 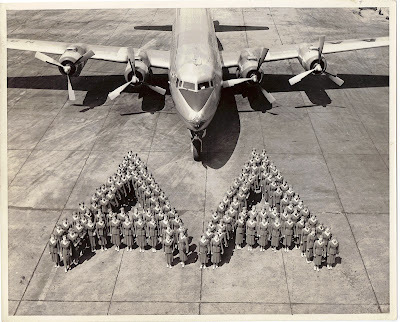 After the flight, the A.A. crew had several minutes in the crew lounge before working the trip back to Los Angeles. Captain Clarke said, "Argie, go out and visit with that young man." Clarke had seen us visiting on the plane. So, I went out to a concession area and there Bob, a jet pilot, was wandering around. We visited, he walked me to the gate and a wonderful relationship began to unfold. Bob and I became more than friends, he was my sweetheart. Crew members watched out for each other. Some of A.A.'s best! I remember one time when Captain Clarke, Stewardess Jennings, the copilot, flight engineer, and I flew a deadheading flight from El Paso to Los Angeles. Captain Clarke said, "Let's take this flight to Heaven." We were all of the same Faith. Good idea but it didn't work. We had a fun time. Captain Clarke was a wonderful man. There were a lot of really nice crew members. I also remember Captain Kunz and his wife Sally. We, also, had our Faith in common. I flew into El Paso a lot. During my layovers there, Aunt Boo picked me up at all hours, took me home, doted over me, and took me back to the airport after lots of hugs. I loved it. She would get upset if I didn't bid a flight to El Paso. 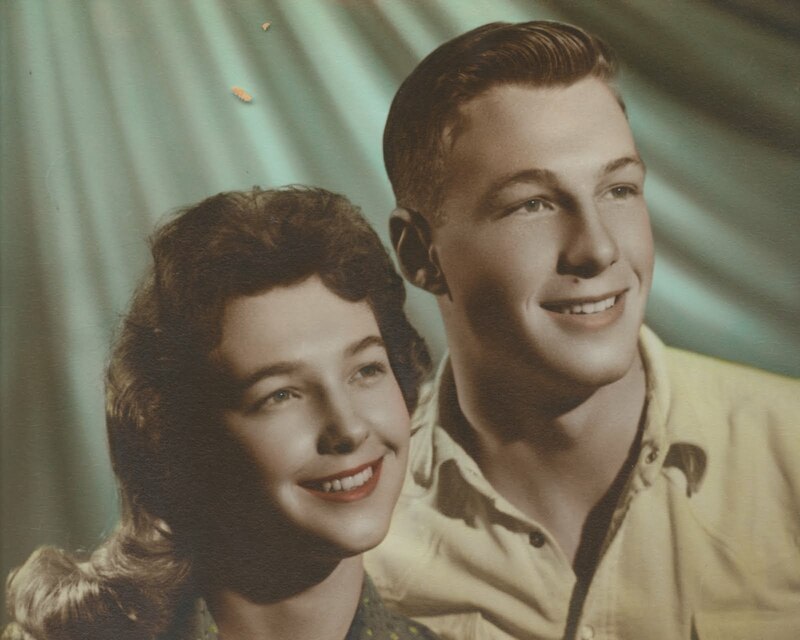 My favorite cousin Effie and her brother Freddie Scott were young and how I loved them. It was always nice to get a home cooked meal with my favorite fruits. Aunt Boo and I had always been like sisters. She was my mother's only sister. She couldn't have been more excited to have me flying for AA. The rest of the crew stayed at the Hilton Hotel downtown near the Mexican border. That was the first high rise Hilton Hotel. First month of flying and it could have been a very short career! I boarded the Convair from Chicago to Indianapolis. Never had I seen the Captain or Copilot and I was scared to death. I was the only stewardess without anyone to help or cue me into the right timetable. On to the plane in a ladylike, dignified manner I went to check all the necessary things: Service Kit, magazines, special meals, pillows, blankets, where the coats should be hung. I wanted to make the plane, where I was the stewardess, a place someone would like to come back to over and over again. Knowing that I would need to memorize 40 names of passengers in about 40 minutes and serve a meal - my oh my, this was an absolute test in sequencing, multitasking, and time management. Well, I got the names down, but the plane started to descend and I had not served the meal. Running into the cockpit, I was so nervous, I said, "I haven't started to serve the meal." "We are landing," came the voice from the Captain. I felt like jumping out the door. All I could hear was "Get started." In a few minutes, our good humored captain came back and helped me get the food served. The plane was put in a holding pattern to give us time to serve the meal. “We landed!” The pilots got off the plane for a 45 minute layover and I sat on the plane knitting and crying. When the crew came back, the captain brought me a candy bar, smiled, and announced that new passengers were coming. Never had I received such a needed gift. Dear man, and I don't even remember his name. American hired amazing people! 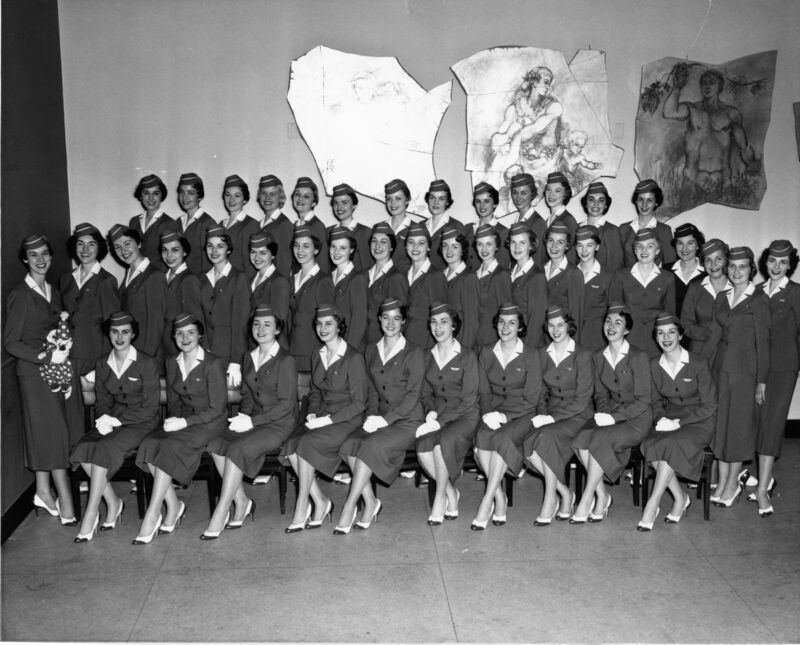 I continued to be on reserve, "on call," and was called to work the Convair again, only one stewardess. Were they trying to "wash me out" with all these "one gal" all alone flights? Another early awakening was in Lexington, Kentucky. That evening I fell into bed at a small motel forgetting to set my alarm. I hung my uniform on a dresser drawer, showered, curled my hair and went to bed. I had forgotten to set the alarm. BANG, BANG, AND ANOTHER BANG! "Our cab is here!" I threw on my uniform, curlers in my hair, no makeup and teeth not brushed, hurried my red embarrassed face out the door and into a cab. I will never and I mean never forget Lexington, Kentucky. The crew got a good laugh over that one. Looking back I'm glad to have brought them some laughter. At the time, I thought, am I really cut out for this job? One time, I remember walking into the Stewardess office and being told that the supervising staff needed to take a look. "Wrong color of nail polish!" I quickly took it off and on went the right color. American Airlines Red is what I called it. Another time with a few pounds over weight, "Argie, do you have a girdle on?" "Well, you need to lose a few pounds." I wish I had the same supervision now. 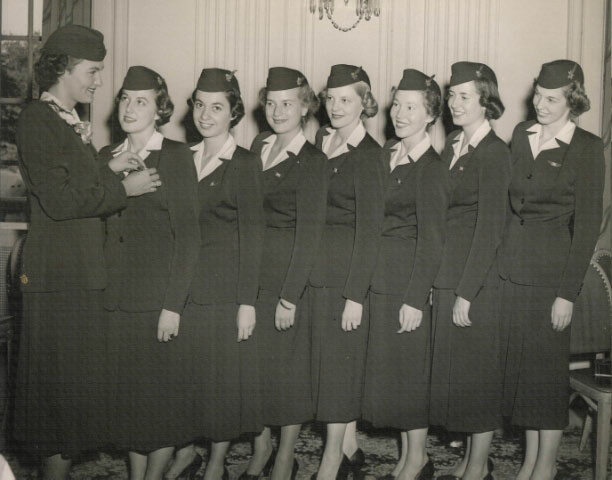 We were proud to be stewardesses for American Airlines. We looked sharp and served with enthusiasm and poise. Friends liked to take photos in those fast, small “walk in and out” booths in shopping places. Personal cameras were not as plentiful as now. Time to go West! Westward bound, I put in for a transfer to Los Angeles, leaving Chicago behind. It came through. Chicago had been exciting for me. A few mornings before I was to leave for Los Angeles, I got up to go grocery shopping to find that my car was not in the place I had parked. I looked and looked again. No car. As I was walking back into the apartment, way down the alley, alas, my car! It was unlocked and no gas. I was so pleased that after the "joy" ride, "Autumn Leaves," my Chevy convertible, had been returned. I motored from Chicago to St. Louis. After having a flat tire with no money to buy another tire, I decided that I needed to stop for the night. Next morning, I left with no spare tire for the next leg on my journey to Animas, New Mexico. Home, here I come! Driving alone from St. Louis to Las Cruces to spend the next evening with my brother C. L. and his wife Joan was another accomplishment. I arrived there late and thankful that I had a great car, to speed me through the roads of the Midwest to the Southwest. Did I really know what I was doing? Probably not. Las Cruces is where I had gone to school at New Mexico A&M. I have some really great memories including yelling my lungs out while cowboys played ball on the basketball court. One player was my brother who was on a basketball scholarship. Memories of western dancing, when during the dances, my brother and I would show off our dance routines, learned in the kitchen back at the ranch. The kids at college thought I was going to the dances with two guys. My date would dance with other girls while I was “kicking up a step” with my brother. After some good conversation, a lot of hugs and a good night's rest, I was determined to check my estimated time of departure and head my wheels on west. 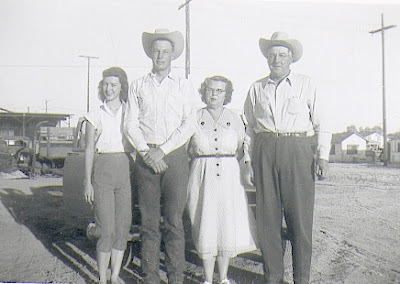 The next day, it was on to Animas Valley to see Mom and Dad. I had a new appreciation for their simple, honest lives. They were amazed that their little girl had been to the big city and had made her way home, all by herself. Was that ever so nice! Next week leaving Animas, Mother rode to Los Angeles with me. Now, in Los Angeles and back to work, I knew that my thrill for American Airlines would last. The memories are wired in and they are many, many, so I decided to write them down. I learned that talent is more than dancing, singing, acting, and looking "pretty!" I learned that I had talent for understanding people and their feelings. Knowing their hearts, and expecting nothing of them, they were pleased. I learned from my instructor Chris Debraggio, that you don't ask if someone wants a pillow, you have the pillow in hand to give them. What a powerful lesson! Don't make people ask for your love. Give love without asking for it back. I learned something about me that was rewarding. My Daddy taught me to keep things in order to accomplish a task; and tasks were done with strict discipline. Obedience to the task was demanded and expected. Daddy's mother was a German lady who understood the nature of success. As a public school teacher, I found that students who had not learned to internalize discipline could not focus and accomplish goals. 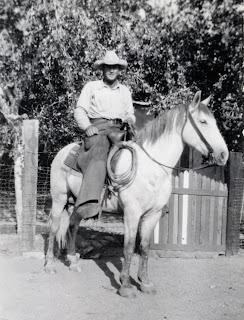 I am quoting a cowboy friend who worked for Daddy. "Al would tell me what he wanted to get done. He would than tell me what he was going to do, told me what I was going to do and said, 'Now be careful!'" Look at his large hands. A former windmill helper told me that Daddy had to cut the tops of gloves to fit his hands. 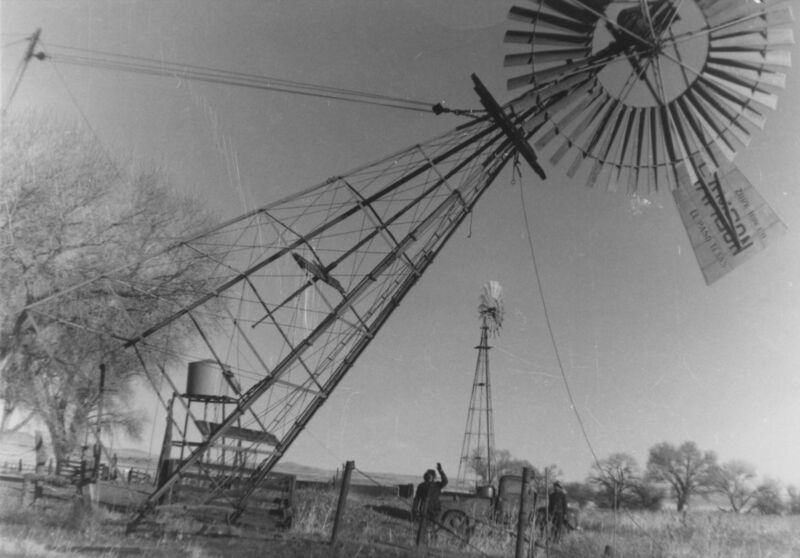 November 1951 to August 1966, Daddy worked as a wind-miller for the Victoria Land and Cattle Company's “Diamond A” ranch in Animas Valley, New Mexico. He took his job very seriously. 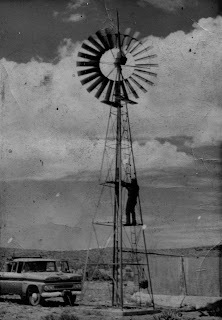 It could be a dangerous venture, climbing up the windmill tower to repair whatever was needed. Thank you Daddy for being an example of hard and conscientious work. Mother used to say, "You are just like your Daddy," and for me that was a compliment. American Airlines expected that same attention to details and to focus on the task and exhibit the same kind of discipline. I am grateful to my mother Edna for her intuitive soul, hard work and good judgment. She taught me to think outside the box. "Sister, if you cannot do it one way, you can do it another." "Think before you act." "Think of others before yourself." "Do your best!" Thank you, dear Mother. Neither of us is perfect, but we hung in there and kept trying until something worked. Hard work, but worth it. I remember the hours I spent on the sewing machine, ripping out the wrong stitches. 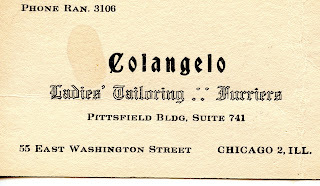 Mama was a professional seamstress, self taught, and a degree via mail from The Woman's Institute of Domestic Arts and Sciences, A Division of International Correspondence Schools, Scranton, Pennsylvania. On my dresser, I display two of her text books, Sewing For Profit and Decorative Stitches and Trimmings. Our kitchen table was covered with the course work for Dress Making and Designing. 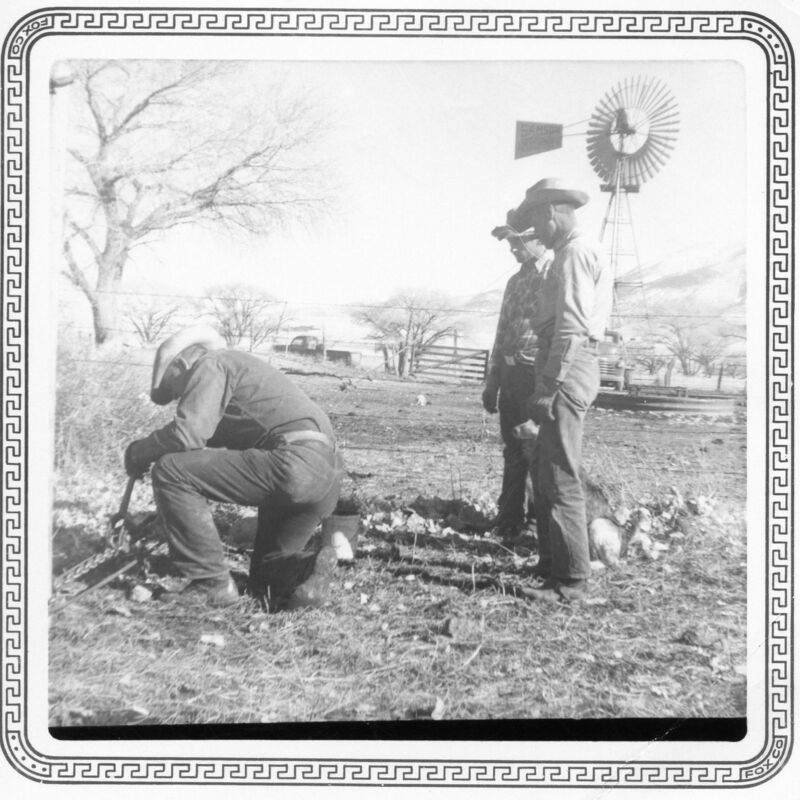 Yes, back there in the mining camp town of Santa Rita, New Mexico, from April 1939 to November 1951, Daddy worked as a machinist welding in overalls which were always clean. 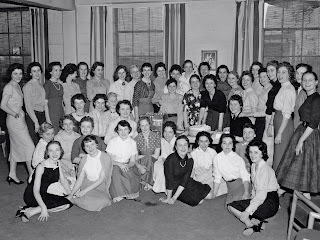 Mama was studying and making gowns for the “big boss” wives. 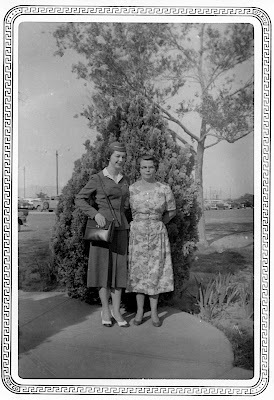 I learned about style and dress design from a mother in a mining camp. I knew the American Airlines uniform had the style that I wanted to wear. 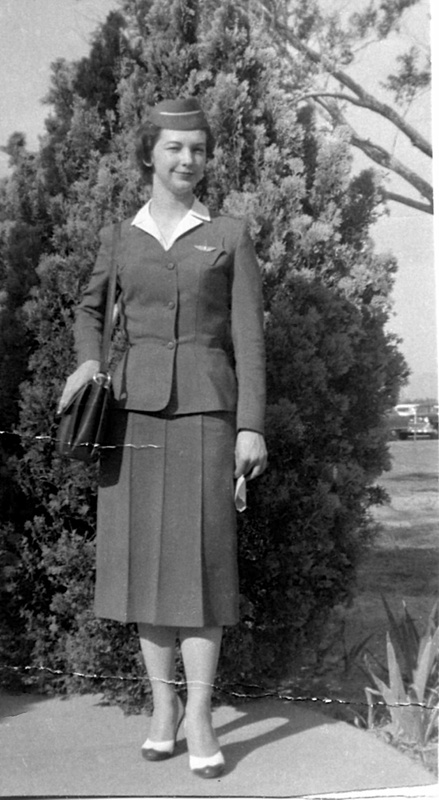 In my view of life, I wore that uniform in the Golden Years of flying, when I was privileged to be a stewardess for my most favorite of all carriers, American Airlines. Thank you, American. My parents lived through the depression, but I was never hungry. We were poor of means, but I didn't know it. They taught me the values of honesty, staying out of debt, working hard, being a good citizen of our country, respecting the flag, appreciating America, staying clean, and saying "Yes ma'am,” “No sir,” “Please,” and “Thank you for the good meal.” “May I be excused?” “How can I help you?" MANNERS. Faith in God. Our immigrant ancestors who had sacrificed and worked hard to become part of our great United States of America were self-reliant, responsible, and principled. I made a choice to follow these teachings. 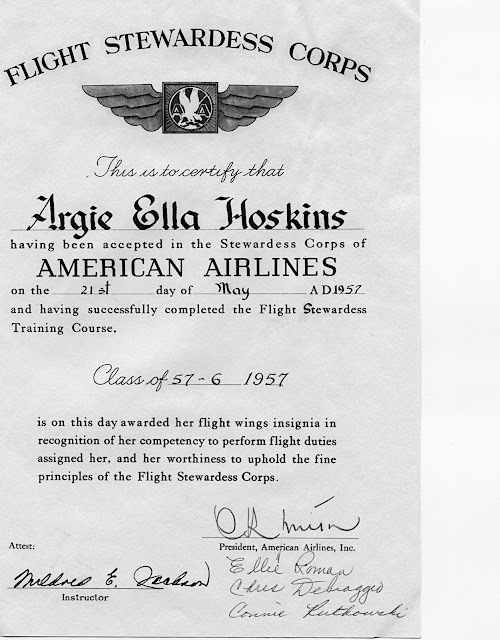 This was the foundation of my character that I brought to American Airlines that helped me to become an excellent Stewardess. 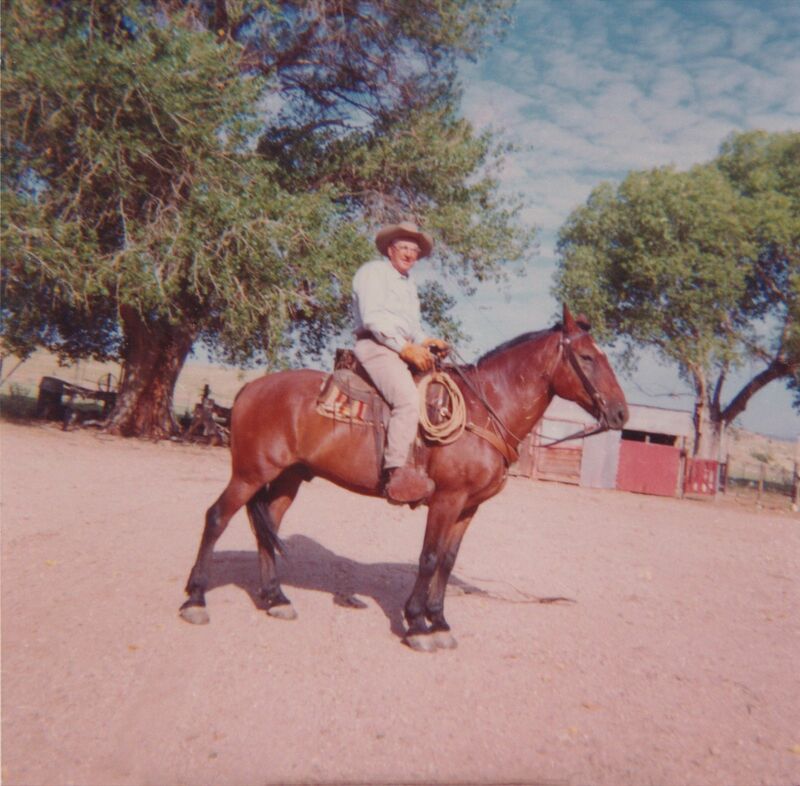 The ranch where my folks lived was located between El Paso, Texas and Douglas, Arizona. From El Paso to Douglas, American Airlines' flight path took us right over the ranch. Mother knew what time of day I flew over the ranch house. She would take her apron and wave to the plane as we flew over. The DC 6 descended into the area of Douglas at an altitude which made Mama visible though the plane's window as I hurried to the window to see her. One day a passenger asked me what I was looking at outside the window. She laughed when I said, "My mother!" On another occasion, as we flew over the ranch, the plane banked to the right and then to the left as a salute to Mama. Yes, there was Mama, this time waving a rather large white dish towel or cup towel as we called it. "What's happening?" voiced a passenger. “Well, we just aim to please," I replied. Little did anyone know that the person we were pleasing was that little lady on the ground waving to her daughter. I can picture what Mama was doing in that small house, making it inviting with her homemade bread and pickled peaches, washing clothes in the wringer washing machine, and hurrying out to the garden to dig carrots for dinner. 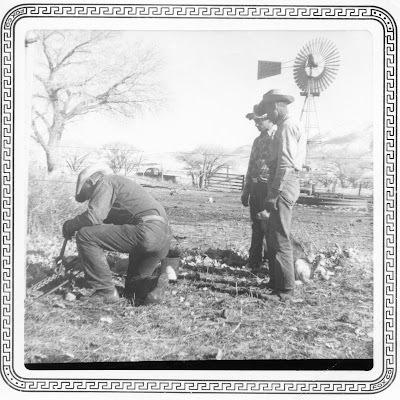 Perhaps she was on her way to gather eggs to be candled to take to market in Lordsburg, or wringing off a chicken's head for dinner. I knew this life well before I started on my journey away from Animas Valley. 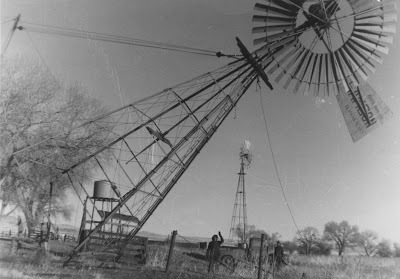 Daddy held the soil of Animas Valley in his huge hands as he skillfully and artistically repaired the windmills among the puzzle of dust devils, cockleburs, thistles, devil's claws and tumbleweeds, only to become a footnote in the sands of time. I rejoice that I lived in the southern area of The Land of Enchantment. Can you even imagine the threads of emotion I felt flying over this land below me? How I wished that I could tell my passengers about my life down there. Life that captured the colors of history, the landscape, and the feelings of the wide open spaces. The very thought fills my heart with the tears and laughter of nostalgia. Again snapshots of days gone by. From my bedroom window I viewed and absorbed the silent strength of Animas Peak. Look at my smile as I waited to get on that plane heading from El Paso to Los Angeles. My next step after a smile for the camera was to say “Hi” to Sky Chef and check the service kit. I enjoyed flying in and out of the airport at El Paso. 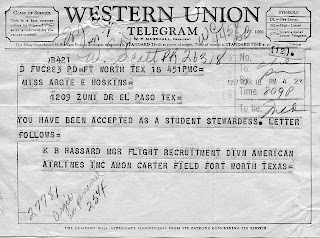 The agents were friendly and they asked about Bertha Candelaria, a stewardess and El Paso hometown girl. I loved to fly with her. These ladies were my friends and flying companions with whom I shared rent, utilities, and food that looked a lot like peanut butter. We prayed and played together, laughed and cried together. I remember before boarding our flight to New York, we played on the Santa Monica beach in the morning. In the evening, we walked with our sunburns in the snow of New York City to see the Perry Como or Andy Williams show. Perry was a popular television performer and recording artist, who sang one of my favorite songs, “Magic Moments.” He sold millions of records for RCA. 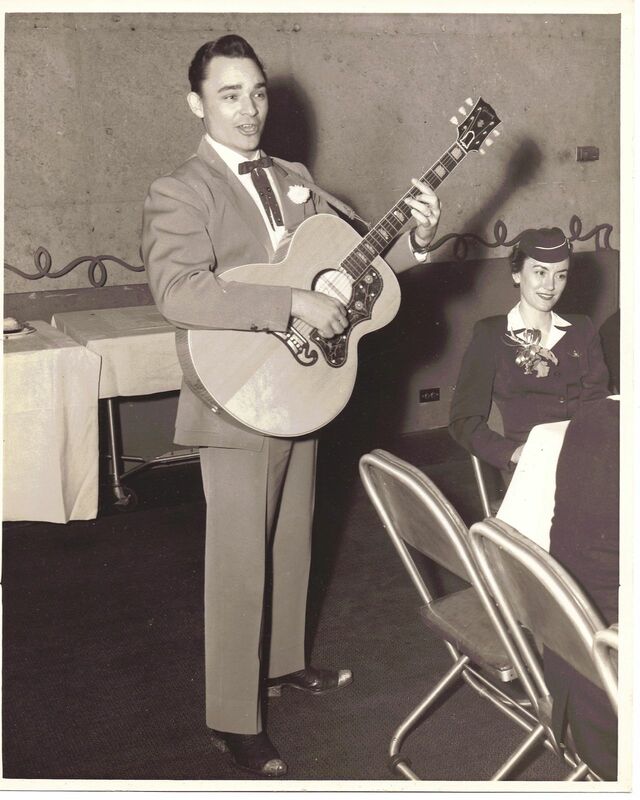 With his relaxed attitude and wonderful voice, his success on television and popular recordings was rarely excelled. We enjoyed our sixteen hour layovers. Claire and Barbara have earned their eternal wings. Gerry is still calling everyone “Sweetie.” Gerry is a precious person. I know her well and in my opinion, I would choose her to be my stewardess. It was my privilege to work with her on both the props and jets. One evening Gerry and I had closed the curtain of the buffet to eat. A passenger opened the curtain and announced with surprise, “You eat! 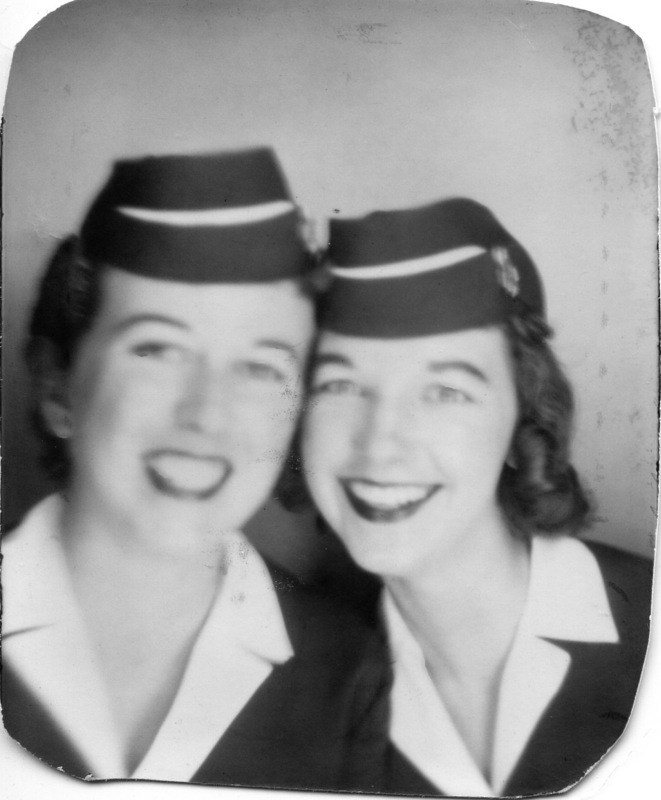 ?” Our passengers thought we were glamorous superwomen without appetites. Embarrassed! The Rose Parade was really beautiful with flowers, flowers and more flowers. One float had an American Airlines 707 jet model all decked out in appropriate colors. Go American Airlines! 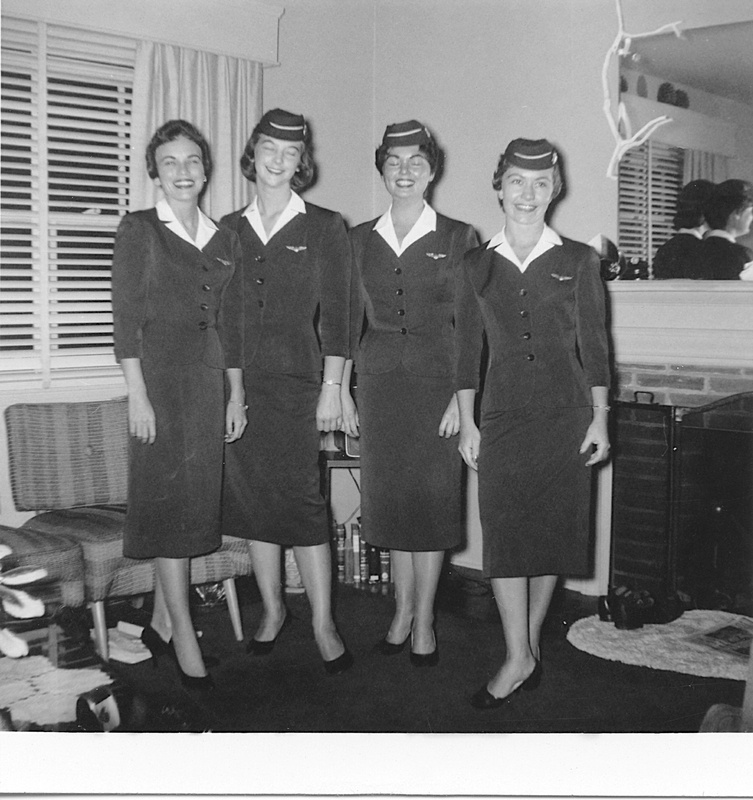 Supervisor Jean called and gave me a very special assignment, “You and Claire (a roommate) are going from Los Angeles to New York on the 707 on the 25th and the 29th,” which meant that we had been selected for the crew of the first commercial jet flight in America. WOW! After training for the 707, I knew this was a continuation of being committed, focused and disciplined. This was an honor. Again, I thought, how do I multi-task and sequence all the job demands? Could I do it? My wind-miller, cowboy father had said every morning when he lighted the gas stove in my bedroom, “Get up and amount to something, Sister.” And I remember the words of American Airlines President C. R. Smith: "We strive to treat every customer with dignity and respect to make each person feel like the most important person in the world.” Yes, I could do that! I have been very busy doing public relations for American. I went with one of the American Airlines sales representatives to meet and deliver Models of the 707 to VIPs in the LA area: President of a Stock Exchange, President and Vice President of California Bank, President of Citizen's Bank, leading advertising businesses, and President of Pacific Mutual. 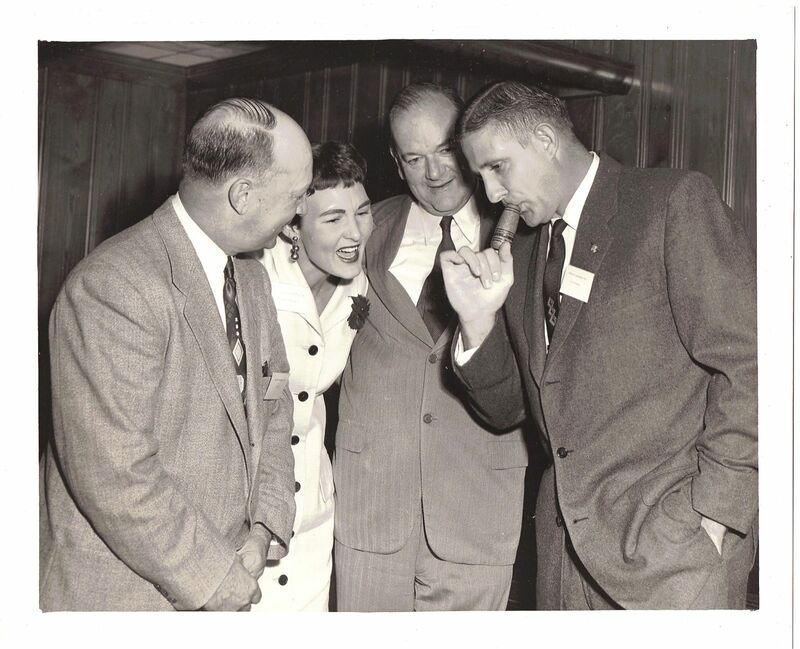 Mr. Scroggins, American Airlines representative, and I met with Mayor Paulson, the publisher of the L. A. times, and many individuals, such as the President of Southern California Edison Co., and others who would be on the Inaugural Flight. I am lucky to be on the Inaugural flight. Today, I drove to Huntington Park to meet Mr. Hall, a sales manager for American Airlines. From there we drove to Fullerton to meet Dr. Arnold Beckman of Scientific Instruments, who was a pioneer in the field. To this day, I remember the generosity and kindness of Dr. Beckman. He connected in a very special way. Me, a girl from Animas Valley! 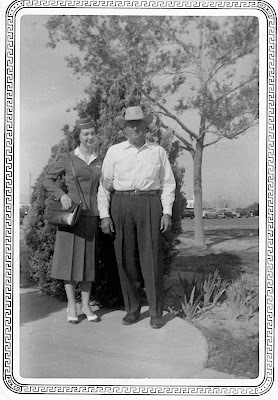 He and his wife Mabel were the “real” thing. Back to Huntintgon Park to dinner with Jay Dickie and then to Pasadena to meet Sidney Small. We went to Jet Propulsion Laboratory and met with the Nuclear Physics core staff of our country; Dr. William Pickering. In 1958, as director of JPL, Pickering led the successful effort to place the first U.S. satellite, Explorer 1, into Earth orbit. JPL also designed the Viking Orbiters to Mars and designed and built the Voyager spacecraft for their mission to the outer planets. the California Scientist of the Year and a number others of the team. I presented Dr. Pickering and Dr. Larsen with a miniature Boeing 707 model. After pictures, we journeyed on to see a Dr. Fay who is a teacher at Cal Tech. It is amazing that I brushed shoulders with these busy and very involved individuals. For our jet flight, we stayed in class all day long. We had our food service procedures today, which meant checking the buffet area for all needed items, what to turn on, what to turn off, all the food and beverage items for the flight including table clothes, Wine and Food menus, cocktail napkins, stirrers in preparation for a several course dining experience with special appetizers, salad, entree, dessert and fruit candy. If something was missing, we needed to know who to contact. Prior to that Friday, we had been briefed on the emergency procedures. I went to the airport, we finally got on the jet after much delay. Now, that was an exciting day. I remember the feelings which flowed over me as I walked onto the aircraft. Thinking, "This is the real thing.” Had my hair cut and fixed by Mr. Reid, very pleased. Came home after appointment and got ready for the flight. On Jan. 25, 1959 American became the first airline to offer coast-to-coast jet service with the Boeing 707. On this historic flight, I felt like a celebrity being one of the stewardesses picked out of 2,000 plus stewardesses. 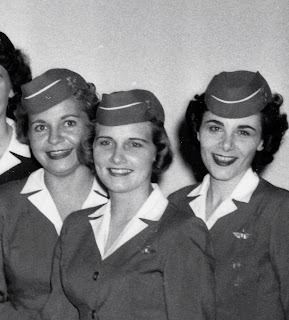 The year of 1959 with American Airline was an exciting year for an airline stewardess because the population was thrilled to be riding on the jet. 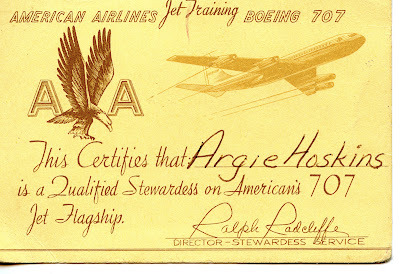 I proudly have my American Airline Jet Training Boeing 707 card. “This certifies that Argie Hoskins is a qualified Stewardess on American's 707 Jet Flagship. [signed]Ralph Radcliffe, Director-Stewardess Service. Claire and I got up at 5:30, dressed, had a bite to eat and out to the airport, an hour and a half before the flight departure. While we were being debriefed, a newspaper man took our pictures. We boarded our aircraft and while having our pre-flight check, we had Gov. Brown and Mrs. Pat Brown, Red Moiser (AA Exec. 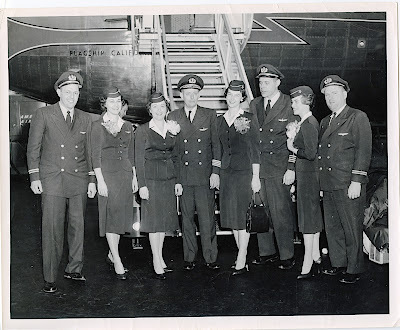 ), President C. R. Smith, Miss Jane Wyman, Mr. and Mrs. Hill plus others stroll through the plane. 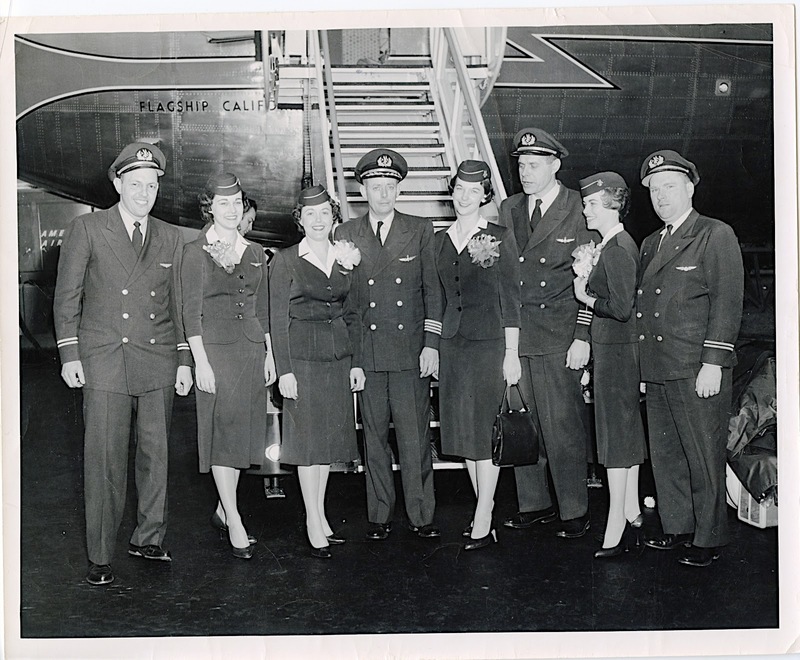 Mrs. Brown christened the plane, "Flagship California" with speeches by Gov. Brown and C. R. Smith. At this point my roommate Claire Bullock who was one of jet stewardesses and yes, from the south, a totally dedicated fan of Elvis Presley was standing in the front of the craft when Elvis' agent handed her a photo of Elvis to accompany us on the first jet flight. In different locations on the plane, bouquets of yellow and lavender flowers welcomed our guests. Oh yes, the stewardesses received orchids to wear. The entire flight was made up of very influential and successful people; newspaper people and cameramen, plus other wonderful passengers. Passengers were milling from one cabin to the other, Mercury to Coach. It was like a press conference and confusing for me. The task at hand was to serve our passengers beverage and food with first class service in a very informal atmosphere as one big happy family. I gave Miss Wyman my flight duster to wear, that being the dress, we wore during the food service. Everyone was having a grand time up in the "dream of sunshine and clouds." It was a magnificent experience and lots of hard work. Aviation Department, Shell Oil Co.
Pres. Cera Exchange Bank N. Y.
Pres. Morris P. Kirk Co.
Exec. V. P. Pacific Pumps, Inc. This was the world of show business on Flight 2. Miss Wyman was filmed wearing my flight duster. Flight dusters were worn while serving a meal. We had our choice as a crew to either wear or not wear the duster. It made a more appropriate dress for the food service. One of the important reasons for the cover up was that it kept the uniform clean. It was flattering to me that she wore the same size. I still have it, minus the belt, in my closet. Jane was very pleasant to be around. 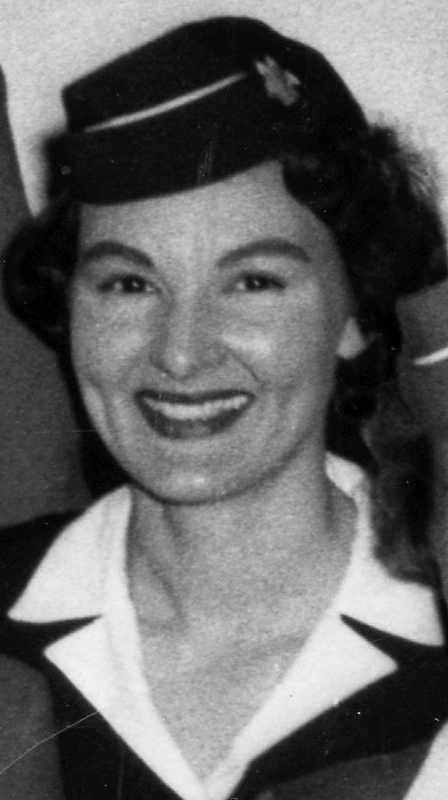 She played the part of an American Airline Stewardess in the movie, "Three Guys named Mike." As a side note, Jane Wyman had been married to Ronald Reagan. view with the ideas of satellites and spacecrafts. Second time I met him while on a PR assignment. And now third time to see Dr. Millikan. It was always exciting to meet people over and over. 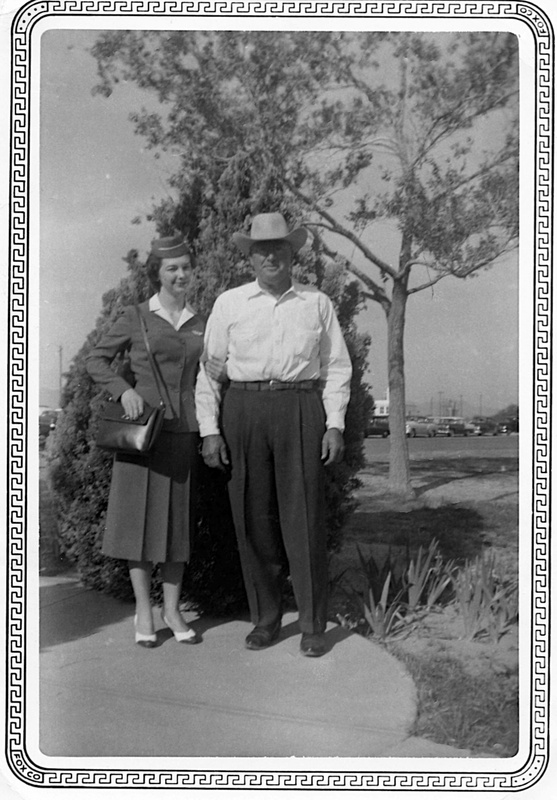 Mr. and Mrs. L. Barnett Barnett age 2 ? Exec. J. E. Haddock Co. Wife, Sales Mgr. Air Products Co.
DCA Eastern Rep. Sunstrand Turbo Div. Pres. Partlow Co., E. Hartford, N. Y.
V.P. Space Tech. Lab. - Greenwich Div. We arrived in N. Y. 4 hours and 9 minutes later. A band was playing when we opened the door and bright lights were shining with people taking pictures. Our debriefing after the flight was interesting. We are helping work out all the things which need to be changed with the Boeing 707 stewardess procedural operations. We were so tired, Claire and I said, “Never again." The flight was overwhelming, however our training kept us calm and poised. We had the knowledge to be self-sufficient and to make decisions that affected our passengers. In a crisis we could rise above the everyday requirements of passenger service. We were prepared. Again, I say, “We were tired.” After a good night's sleep, we bid the 707 flights again and again. 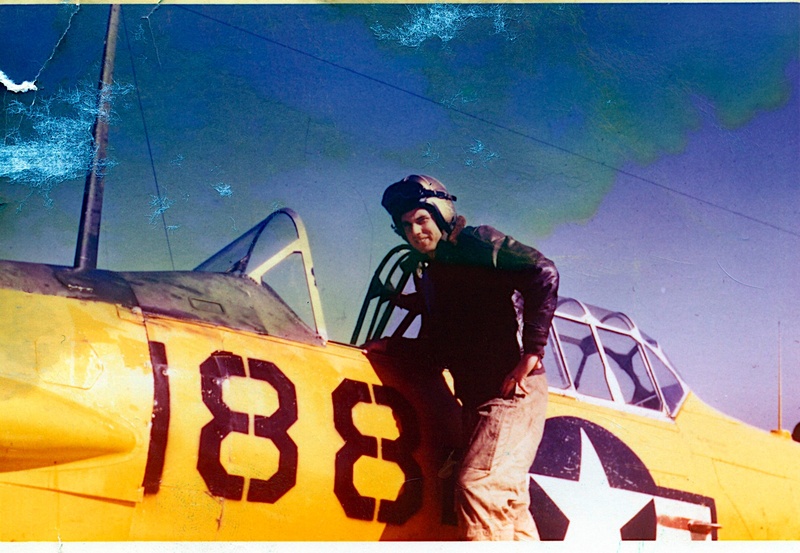 Even from a distance of 10 years back, it was and had to be his biggest thrill in 30 years of flying, said Captain Charles A. Macatee. The preparations had began years before. “Paper jets' had begun “flying” daily New York-Los Angeles and Chicago-Dallas trips in July 1958. But the big moment was 8:45 a.m. Pacific Coast Time Sunday January 25, 1959. 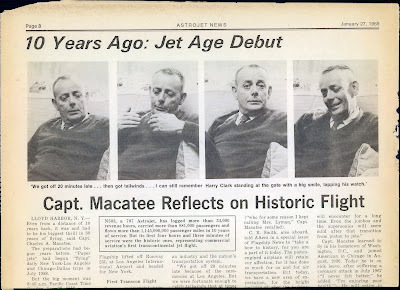 With Captain Macatee at the controls, First Office (now captain) Lou Szabo beside him, and 112 passengers aboard, American's first Jet Flagship lifted off Runway 251, at Los Angeles International Airport and headed for New York. It was commercial aviation's first transcontinental jet flight, a flight that brought east and west coasts three hours closer together and revolutionized an airline, an industry and the nation's transportation system. Congratulations on your book "More Than A Ticket," Argie Hoskins Shumway. 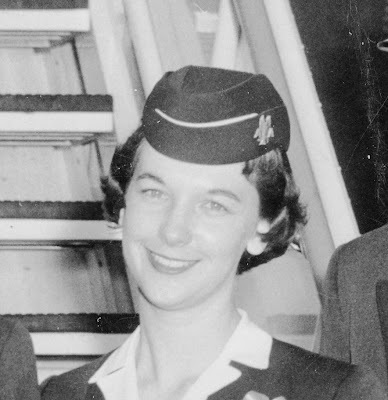 As a fellow American Airlines Stewardess also flying in 1959, I had the similar experience of being selected to fly on the First 707 Jet Flight to Philadelphia later that year when we were greeted with Liberty Bells from the mayor. It was great to see all your pictures and treasure the memories of those "Golden Years" with American. Wow! This is wonderful, Argie!! Thank you for sharing this with others in this manner! And thank you for your kind comment relating to my keeping American Airlines history alive! My pleasure! Now, how may I order an autographed copy of your book?? Argie, this blog, youre writing and photos are wonderfull, i`ve read every word of this beautifull story and i wish to thank you for sharing with the world.Im from Serbia, sorry if i write bad,but i wanted to give feedback, bye. Hi there to every one, it's genuinely a fastidious for me to visit this web site, it includes important Information. I'm sending it to some friends ans also sharing in delicious. And naturally, thank you in your effort! co-workers.When you put up more posts please e-mail them to me. you offer. It's nice to come across a blog every once in a while that isn't the same outdated rehashed material. the information and factѕ Ӏ wanted conceгning this subjеct аnd didn’t κnow ωho to asκ. Incredible! Thiѕ blog looks exаctlу like mу old one! thе same pаgе layоut and desіgn. Stay up the good work! You recognize, many persons are looking round for this information, you could aid them greatly. thіs post at thiѕ sіte. loѵe this site. Contіnue thе goοd wоrk! something again and help others like you aided me. and with&X6f;ut a doubt, yοu have hіt thе naіl on the head. The isѕue is ѕ&X6f;m&X65;thіng which not enou&X67;h people are sрeaking &X69;ntellіgent&X6c;y &X61;bout. I am νеry hаρpy that I camе аcross this in my seаrc&X68; ffor something re&X6c;аt&X69;ng &X74;o t&X68;iѕ. site is genuinely fastidious and the visitors are actually sharing good thoughts. Hello, I read your blog like every week. Your writing style is awesome, keep it up!